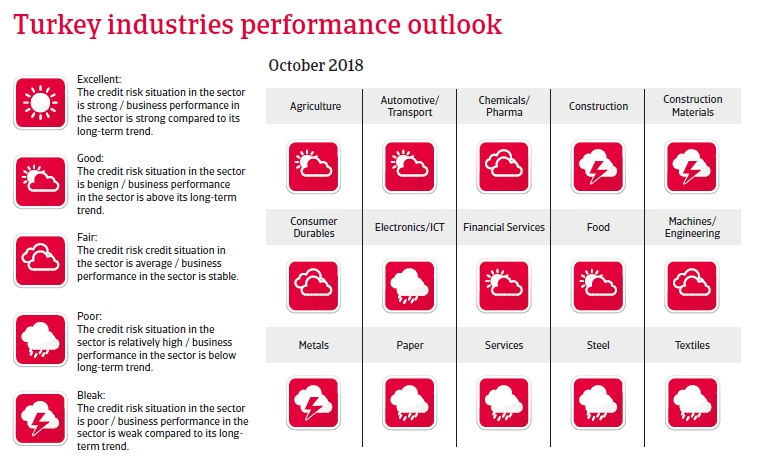 Despite monetary tightening the economy remains susceptible to further currency volatility, and the risk of a severe economic downturn has increased. Nature of regime: Presidential system and secular state. The armed forces´ political influence has been curbed. President Erdogan won the June 2018 presidential elections in the first round, finally consolidating his overwhelming power, as with this voting the transition to the new presidential system has been completed. In the June 2018 parliamentary elections the alliance of Erdogan´s AKP with the nationalist MHP party won 53.7% of the votes. The political divisions within the country persist, and the southeastern part of the country remains affected by the civil war in Syria and cross-border interventions by the Turkish army. Relationships with Western partners (EU, USA) remain strained. Economic growth increased more than 7% in 2017, mainly due to a comprehensive government stimulus package that consisted of tax breaks, employment incentives and credit support measures. However, economic imbalances have increased since then. 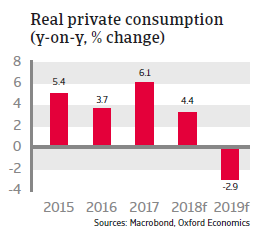 The composition of growth during the recent boom period indicates over-reliance on private consumption and investment in the construction sector. Inflation remains stubbornly high and has sharply increased to almost 25% in September 2018, far above the central bank target of 5%. 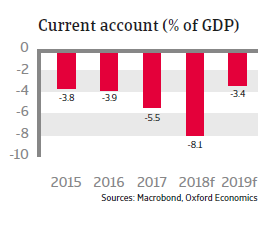 Due to the credit-driven growth (mainly externally funded, given Turkey’s low savings rate) the current account deficit has risen sharply in 2017 and H1 of 2018. 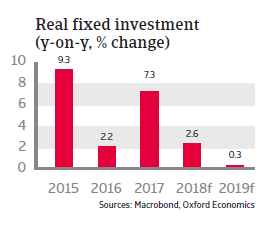 Heightened geopolitical uncertainty, deterioration in institutional quality, an increase in the corporate tax rate from 20% to 22% in 2018 and a low priority on structural reforms are all casting a shadow over Turkey’s business investment climate. 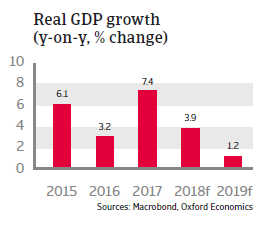 Lack of investment, in turn, constrains productivity growth and export capacity. The risk of a hard landing has sharply increased, mainly due to the sharp depreciation of the lira and the threat that capital inflows are drying up. Since January 2018 the lira has lost about 40% of its value against the USD and the euro. Lira depreciation accelerated following the escalation of a row with the US over the detention of a US pastor in August 2018. However, the main reasons for currency volatility lie deeper: the lira came under massive pressure after President Erdogan repeatedly voiced his unorthodox view that high interest rates cause high inflation and that he will take more control over the monetary policy. This fueled doubts of financial markets about central bank independence resulting in high pressure on the Turkish currency since early 2018. Turkey’s low-savings economy is very vulnerable to capital outflows because a large part of the current account deficit is financed by short-term and volatile portfolio capital inflows, which have been negatively affected by the current issues. Foreign reserves are declining and insufficient to cover the external financing requirements. The situation stabilized somewhat in mid-August 2018 after steps were taken to tighten monetary supply and to limit swap transactions in order to protect the currency against short-selling. Additionally, Qatar announced financial support (USD 15 billion of foreign direct investment and a USD three billion currency swap). Finally, in September 2018 the Central Bank increased its benchmark interest rate from 17.75% to 24%, a hike of 625 basis points, which exceeded market expectation and has led to a stabilisation of the exchange rate - for the time being. That said, the high interest rates will have an adverse effect on economic growth in 2018 and 2019. In combination with a sudden stop in capital inflows, this could result in a credit crunch. Despite monetary tightening the economy remains susceptible to further currency volatility, due to tighter global liquidity conditions, ongoing tensions with the US and the large share of foreign currency denominated corporate debt. The level of external debt, which is mostly held by the private sector (banks and corporations) is high (amounting to USD 220 billion, more than 200% of exports goods and services) and debt is sensitive to interest rate, rollover and exchange rate risks. In case of a permanent real depreciation of the lira of 30%, debt would exceed 80% of GDP by 2023. Non-financial companies in particular run a substantial currency risk with about half of their total loans (close to 70% of GDP) being denominated in foreign currency, while foreign exchange (FX) assets only cover about 40% of FX liabilities. Turkish corporates particularly in the energy, construction materials, steel, transport (airlines) and chemicals sectors have extensively borrowed in foreign currency from local banks. Although a substantial share of this debt is either financially hedged or is held by companies with a natural hedge (e.g. via export revenues), some companies – particularly SMEs but also large corporations – are poorly hedged. This is evidenced by a number of Turkish companies that have recently sought debt restructuring. To address this, the central bank introduced measures to restrict FX borrowing by SMEs without natural hedges. In some major industries payment behaviour has already deteriorated, with extended payment terms and an increased number of payment delays. Turkish business insolvencies remain on an elevated level, with 80% of newly established businesses failing in the first three years. It is expected that business insolvencies will increase, especially in the property, construction and energy sectors. The Turkish banking sector has hitherto been generally well regulated and capitalized. However, banks could be severely affected by continued lira depreciation: Either via higher non-performing corporate sector loans or difficulties refinancing the substantial amount of short-term FX funding that Turkish banks rely on to extend domestic credit. The high lira loan-to-deposit ratio of 148% in 2017 emphasizes the high reliance of banks on external market funding. Turkish commercial banks hold around USD 102 billion of short-term external debt. Therefore, banks are sensitive to rising global interest rates and a drying up of capital flows to Turkey. In order to redress the current economic imbalances additional steps seem to be unavoidable. Therefore, it is expected that financial conditions will be tightened in the coming months. 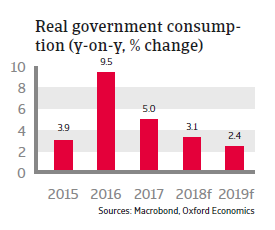 This, together with higher inflation and a weaker exchange rate will hamper domestic demand and probably lead to a sharp decrease in GDP growth in 2019. However, exports will be boosted by the weaker lira exchange rate. This, together with sharply decreasing import demand will lead to a much lower current account deficit in 2019. 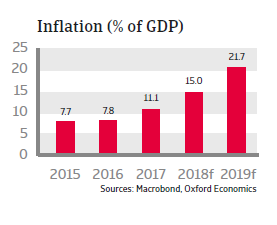 Any comprehensive monetary and fiscal tightening to rein in inflation, coupled with convincing signs that the Central Bank can act independently from political influence would improve investors’ perception. Without comprehensive reform efforts beyond fixing short-term issues the future earnings capacity of the Turkish economy remains constrained by macroeconomic imbalances related to high credit growth, high inflation and a large external deficit, coupled with structural issues related to its low savings rate and weaknesses in competitiveness, limiting FDI inflow. The investment climate is also hampered by a weak judicial system and an inflexible labour market. Moves to privatise state banks and the power sector are also proceeding too slowly. 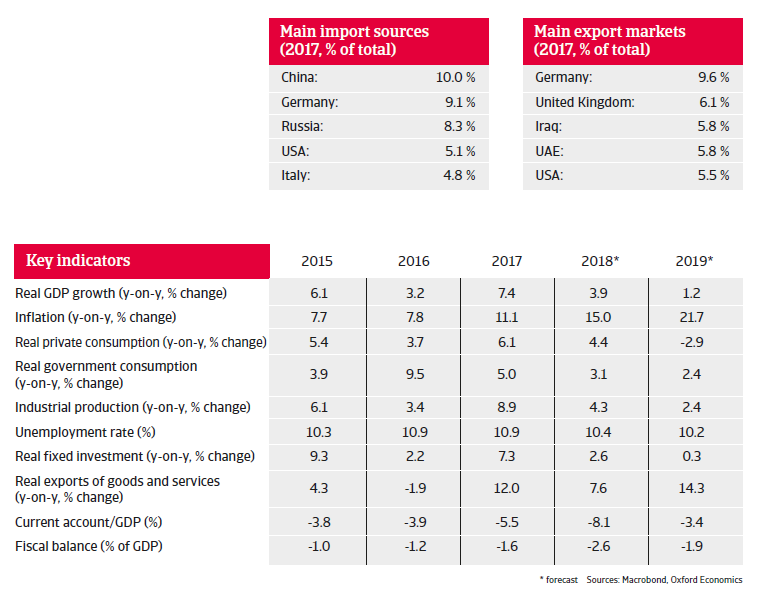 Without structural reforms to raise savings, reduce dependency on energy imports and improve the investment climate, Turkey´s potential growth rate will decrease to 3% - 3.5% per annum - not enough to absorb the increase in the working age population of about one million people per year.